To book simply print out and fill in the Booking Form in one of the formats below, and return with a cheque or pay on-line with any of the 'donate' buttons (it pays direct to the Kent Archaeological Field School) for the correct fee. To become a member (with special offers and 10% discount) click here. Please note that all courses are bookable in advance only and non-refundable. Members 10% discount does not apply to special offers and field trips. An Anglo-Saxon brooch dating to the early seventh century from Faversham in Kent. 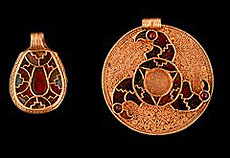 The distribution of finds of this kind in Kent is considered to show that Faversham was a centre for this craft.